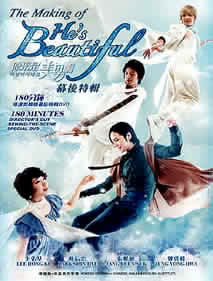 There is a super expensive version of He's Beautiful DVD set which includes the NG scenes. This DVD is basically the NG scenes sold at a very affordable price. UPDATE: actually, the super expensive version is still better with a lot of features, including director's commentaries. the super expensive version has 1 disc for the NG scenes. so this "The making of..." DVD is just that 1 disc. I like the SNSD Genie (Tell Me Your Wish) chapter where u can see the makeup and practice it took for the actors to do the dance. i mentioned about the truck running off with Mi Nam and how fake it was, but i didnt realise the effort it took. so all in all, it was a creditable effort. what was interesting is how the camera angle works. initially Geun Suk was running in leather shoes and that was hard. he switched shoes with one of the background staff and was using track shoes after that. likewise for UEE - you dont really think she walked in stockinged feet after her shoes ended up in the river, right? she wore track shoes! btw, it was hilarious how they had to fish up her shoes from the river. the sweeping dead leaves scene was very funny. Park complain about the dead leaves. are they clean? lol.